It’s that time of year again. We pledge to eat healthier, be happier, and throw money at pricey gym memberships we’ll never actually use. Here’s one resolution worth sticking to: start collecting art. Why should I start collecting art? Unlike that gym membership, the perfect piece of art has no expiration date, no cancellation fees, and is something that you’ll enjoy and appreciate in your home every day. There are also no excuses; technology has made it easier than ever to purchase art. You can buy a painting from the comfort of your living room sofa with the touch of a button. Buying a contemporary artwork is more than just a monetary transaction. Its value and impact extends far beyond the number on the price tag and its place on your wall. When you buy an artwork, you are investing in your community, promoting the arts as a cultural institution, bolstering the career of an emerging or mid-career artist, and possibly, embracing a meaningful message or cause. The first step to collecting is knowing what you like and what you don’t like. Collecting art is less about aesthetics and more about self-expression. The best piece of art—the one that’s truly worth your investment—is something that captivates you both visually and emotionally. That something is different for everyone; taste is personal. The more time you put in, the more you’ll refine and clarify your personal taste. If you aren’t exactly sure what speaks to you, look around and see what’s out there. Visit auctions, galleries, and museums. Events like SoWa Boston’s First Friday are great opportunities to explore a diverse range of styles and converse with gallerists and artists alike. Browse through websites like Artnet and Artsy. Scroll through Instagram (try #contemporaryart). The educational process of collecting is an ongoing one… The more informed you become, the easier it will be to identify what you like or dislike and why. Natalia Wróbel. Oil on canvas. 72x60 in. Art collecting is for everyone. Whether your budget is $100 or $100,000, there is something out there for you. Buying and collecting art should be easy and affordable, and fine art should be accessible to everyone. Don’t be discouraged from pursuing an artwork a little out of your price range. ArtMoney is a great tool for fitting that once-in-a-lifetime, have-to-have-it piece into your budget with monthly payment plans. Always acknowledge what you like, regardless of what you may think you’re supposed to like or what is current. 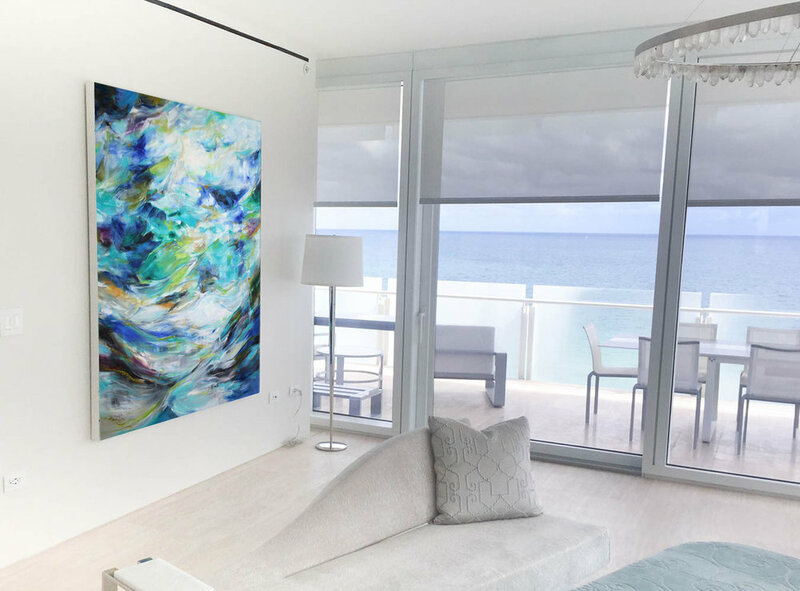 Your art collection is a reflection of you, so be true to your personal taste. The real value of collecting comes from the enjoyment of having a great piece of art in your home, not from the potential of re-selling at a higher price. Your art collection is an embodiment of your identity and individuality, much like the clothes you wear or the music you listen to. Over time, your collection will expand and evolve, becoming a visual diary of your life and a timeline of your personal evolution.